Another vid from Cordebra on YouTube. 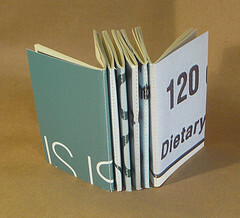 This is a journal made in 2004, shuts like a moleskine but is more colorful on the outside. This entry was posted in Inspiration and tagged art, craft, create, diary, do, inspiration, journal, make, moleskine. on 20080802 by leslie. A little blurry but a nice little vid of a handmade journal filled with art. Love the Hedgehog binding and the finished journal. It’s quite nice. This entry was posted in Inspiration and tagged art, craft, diary, do, hedgehog, inspiration, journal, make, moleskine., notebook, prompt on 20080726 by leslie. This is a neat little animation featuring a notebook as a backdrop. I’m pretty sure it’s only MADE to look like stop motion animation but tis’ pretty sweet anyway. I liked it quite a bit. This entry was posted in Inspiration and tagged art, craft, create, diary, do, inspiration, journal, make, moleskine. on 20080719 by leslie. Another moleskine brand sketchbook. I like this one too. This entry was posted in Inspiration and tagged art, craft, diary, do, inspiration, journal, make, moleskine., prompt on 20080712 by leslie. Check out this cool Moleskine brand Japanese fold notebook. I particularly like the smoke treatment. This entry was posted in Inspiration and tagged art, craft, diary, do, inspiration, journal, make, prompt on 20080705 by leslie. Get 3 waterproof containers. In the first put 3 drops of ink, the next 5 and the last 8. Add to each jar 1oz of filtered water. Mix well. Start with the lightest shade and start an image. Work your way through an image, adding darker darks until you work your way up to straight india ink. Try a springy liner brush and a small mop. Ink wash is fun and forgiving. This entry was posted in Uncategorized and tagged art, blogging, craft, create, diary, idea, jouranl, prompt on 20080702 by leslie. All about crayons and using them as a resist. It's short it's fast. Watch it. This entry was posted in Uncategorized and tagged art, craft, create, diary, howto, idea, inspiration, journal, prompt, whathump day on 20080625 by leslie. Just a quick update about my etsy shop. I've got loads of items up there though I've not been posting about them. This entry was posted in Uncategorized and tagged art, bound, diary, draw, hand, handmade, journal, paint, sketchbook on 20080624 by leslie. Celebrate Your Creative Self (CYCS from here on) is a book that is for "artists" it's supposed to help you unleash your inner artist. There are 25 exercises in this oversize book that if you are in an artistic rut that if you read and DO them that can help get you out of that rut. (Sort of like when you get your car stuck on ice and you use your car mats to get unstuck…) The key here is that the ideas within are EXERCISES. That means you have to get your materials out and use them. That's the hard part. The exercises are easy and can get you working sort of in that automatic writing style. Once you get going you "get going." This book is easily found just about anywhere and is easy to read but it's a studio book and not a bed side book. I give it 3/5 binder's needles and 1 paint covered thumb up, only because I like my art instruction separate from my inspiration. This is a great book if you like the 2 mixed. You can get it here. Here's a video from Millande with a short clip about the book. Turn your volume up, otherwise you won't be able to hear her audio. This entry was posted in Uncategorized and tagged art, book, craft, create, diary, do, how-to, inspiration, journal, make, review on 20080623 by leslie.